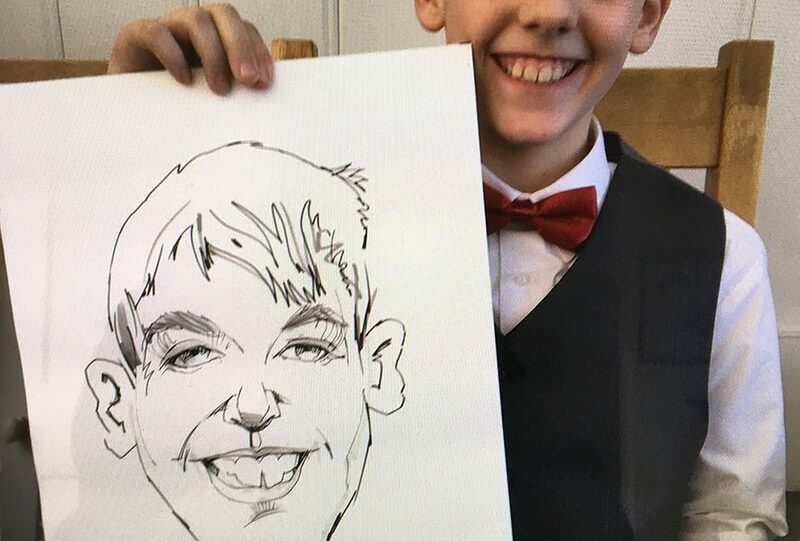 My name is Paul Gurney and I am a portrait caricaturist based in Kent. 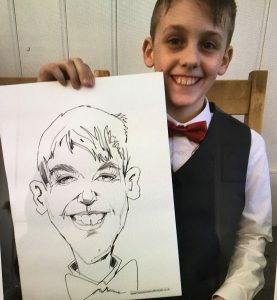 I have been drawing caricatures at events for over 5 years now entertaining guests with fun drawings. Mostly, I travel all over the South East of England drawing at lots of different venues and events. Some notable clients and venues I have drawn at include Claridge’s in London for a wedding, Blenheim Palace for a corporate dinner and The British Army for parties and balls. Everyone loves what I draw as a caricaturist. When drawing I try to strike a balance between my drawings being a good likeness and having an element of humour. Most importantly though I make sure they are always complimentary. For instance, I make sure the ladies are always glamorous with a 60’s chic look. Just send me an email or call me to check my availability for your event. Then I will get back to you to let you know if I am available, as soon as I can. As a caricaturist I charge by the hour at £80 per hour for weddings and private parties. For corporate events and corporate parties I charge £100 per hour. I have a minimum booking time/cost of 2 hours for under 1 hours travel distance and a minimum booking cost of 3 hours for up to 2 hours travel time. Of course, I will consider travelling anywhere for a pre-arranged fee. Hopefully, one day, I will be booked to draw in Dubai, fingers crossed. My drawings are drawn more at the likeness and portrait end of the scale in caricatures. So getting a good likeness of the sitter is a top priority for me, adding the fun element as I draw. A more bushy hair doo maybe, slightly bigger ears or possibly sleepy eyes. It depends who is in front of me. Usually I draw my sitters ‘front-on’ with them facing me and not at a three quarters angle. A three quarters angle lends itself to a more cartoon approach and that is not what I am trying to achieve. When people sit in front of me I immediately look for the key points that make them who they are. As a caricaturist my aim is to be different. There are a lot of caricaturists in the united kingdom who are already very cartoony – I don’t want to be one them. The style I draw in is my natural style and I hope that reflects in the quality of my drawings.